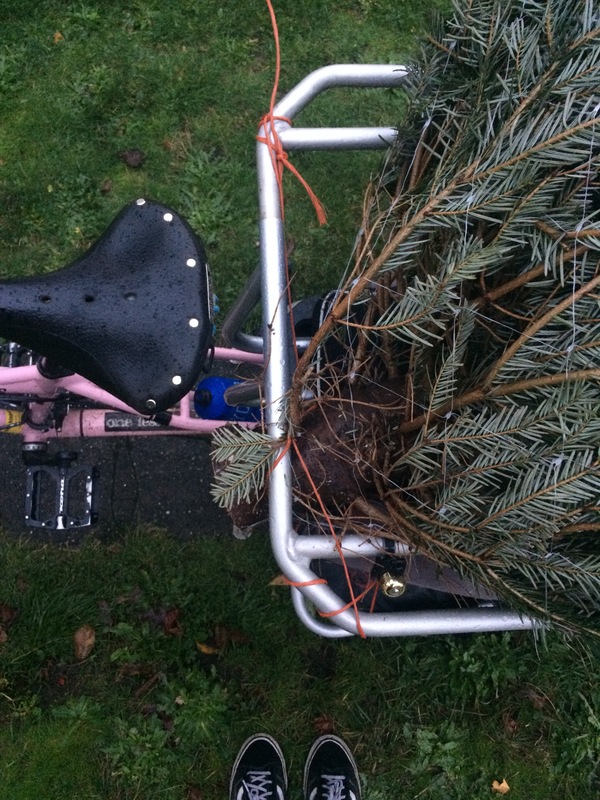 “Go Team Christmas Tree!” is one of the many things people shouted at us as we biked home with our tree this year. There’s something to be said for parading six miles with a big tree. Last year we got the tree just half a mile from home. 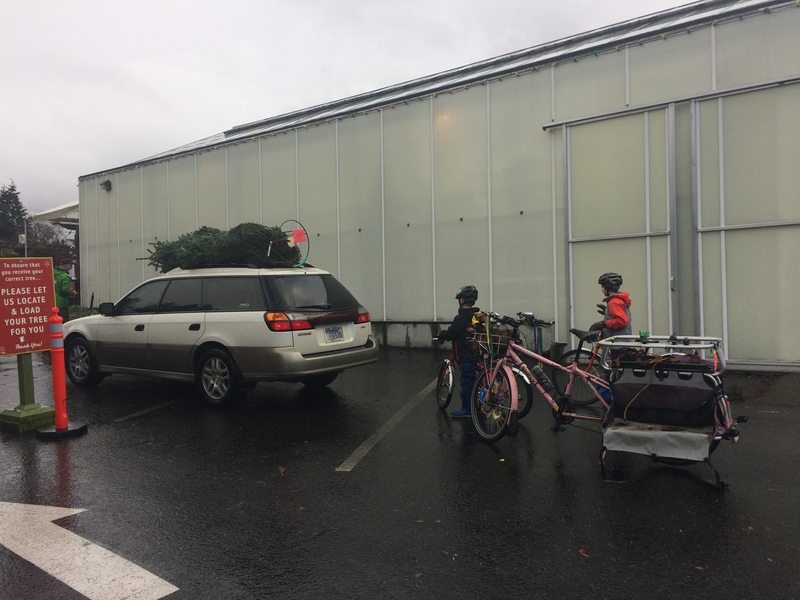 That was the first time the kids rode their own bikes so that was exciting and new (for them–I would have liked carrying both kids and tree because the bigger the load, the more points). 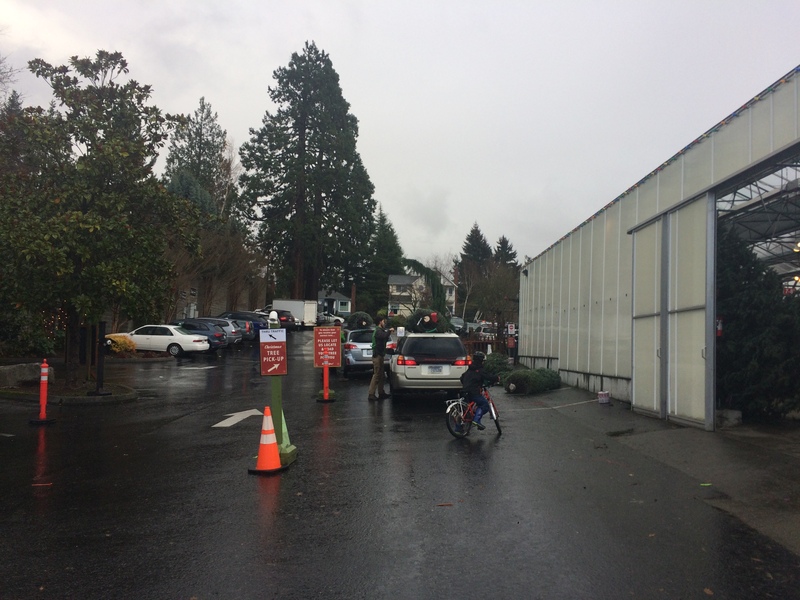 We probably would have gone to the same tree lot, but it doesn’t seem to be there this year and the kids suggested the Swansons Nursery Reindeer Festival. 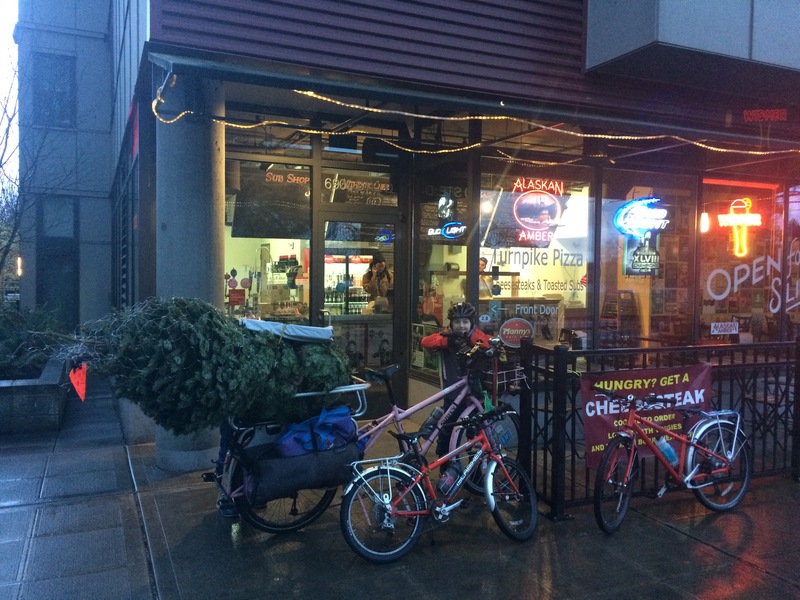 So this year was both kids-on-their-own-bikes and far-away-tree. Fun! Six uphill miles is too ambitious for my seven- and nine-year olds to do all in one shot so I planned for a stop or two on the way there. This would also make for a nice break from the cold and rain. We started with one and a quarter of our steepest uphill miles to doughnuts. Pixie the dog came along so I hoped the kids would eat their doughnuts inside Mighty-O while I kept Pix company outside, but they voted to keep the pack together. Fortunately it was early enough (and uphill enough) in our journey that they were plenty warm and they downed their doughnuts quickly enough that they didn’t get chilly sitting still outdoors. We made it three more miles when I dropped my chain which dragged my front derailleur mount clamp out of place. Naturally this happened while the kids were half a block ahead of me (I can usually keep up with my nine-year old on hills, but every once in a while he joins his little brother to leave me in the dust), but they eventually heard my hollering and came back for me. They don’t go through intersections without me so they would have discovered my absence soon enough. 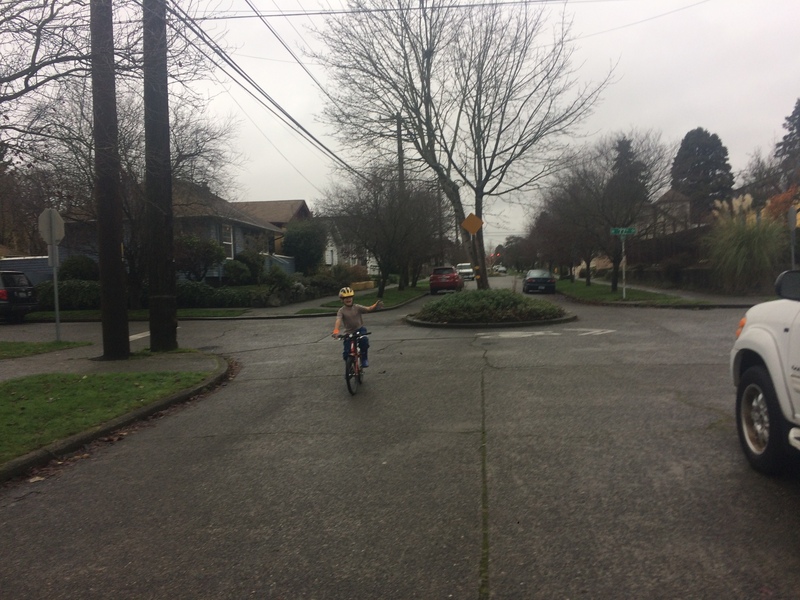 However, I’ve been encouraging my seven-year old to do a bit of bikey wandering and for a mile leading up to this catastrophe he was u-turning around the Fremont Avenue Greenway traffic circles to zoom back and practice bike-by high fives with me. Now he’ll probably assume I’ve broken my bike every time he gets far ahead of me. While setting my derailleur back to the right spot, my seven-year old pointed out he had a flat tire. I move my repair stuff from bike to bike and don’t always have everything with me (and never keep kid tubes with me unless we’re bike camping). 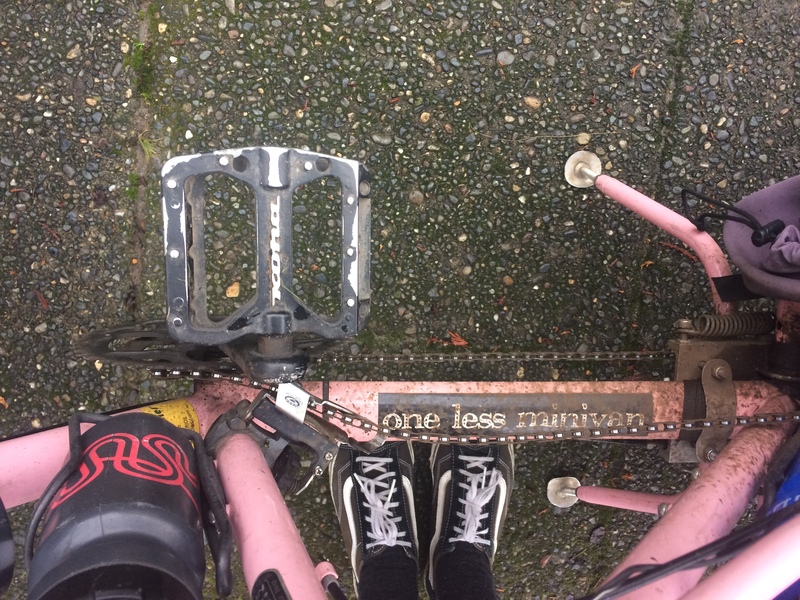 I had my bike pump and a tube for my 26-inch tire, but no patch kit or tire levers. Oops. Fortunately we were very close to JRA Bike Shop so I loaded up my little dude and his bike and off we went. This was my first visit to JRA’s new location and I love the new, bigger space! It was also perfect timing for avoiding a downpour and to warm up for a bit. 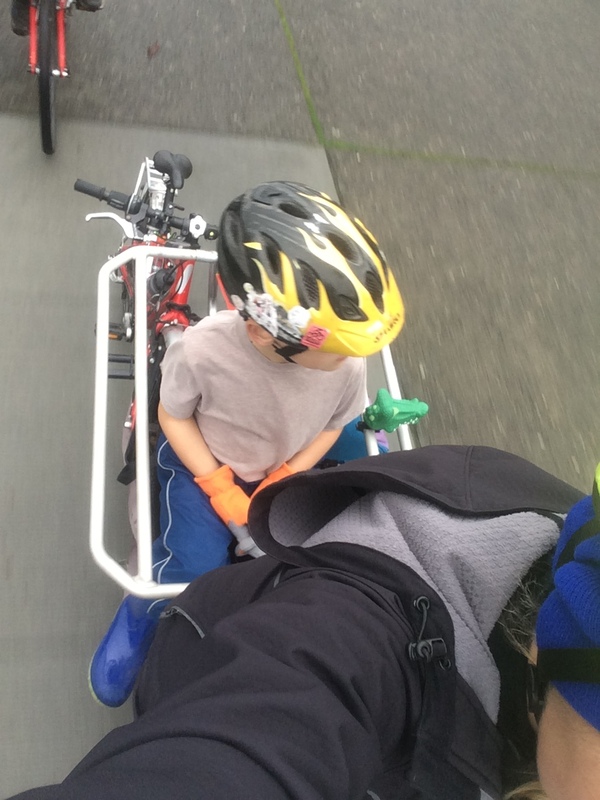 They had a small Surly Big Dummy built up so I took it out for a test ride. Amazing how light it is without all the kid stuff on it. My bike weights about 75 pounds, but this one was easily heftable. I didn’t realize the deck is green this year and I can’t get over how cute the matchy-matchiness is! JRA has great commuter bike stuff, like Rainlegs rain chaps and Bar Mitts handlebar mittens. 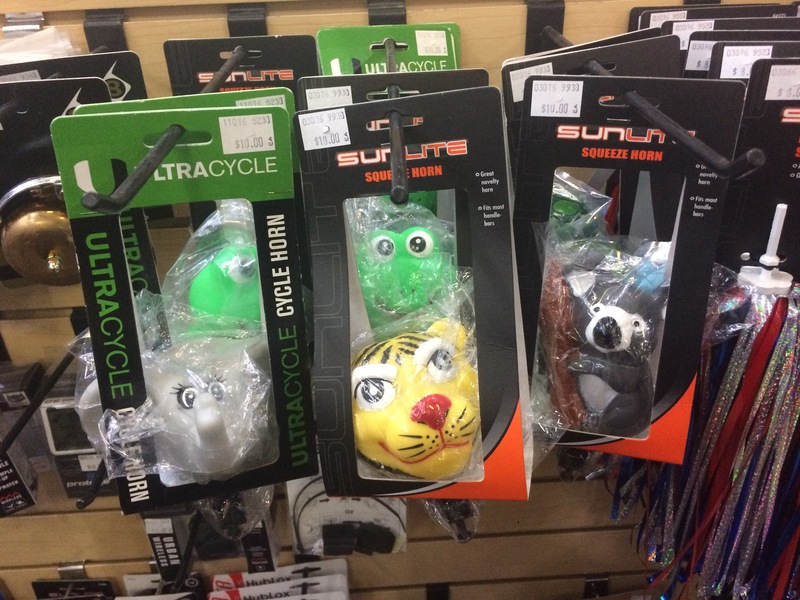 We also like their bike bell and horn selection and picked up an orca and dinosaur. Outfitted with a new kid tire and tube, checked-over mamabike, horns, spare tubes, patch kit, tire levers, potty breaks, and doughnut, we were ready to roll again. One mile and fifty puddles later we were at Swansons Nursery. Unfortunately no Curly the Camel this year, but we were forewarned by the website that he’s temporarily away due to a hurt leg. We also happened to see a friend who works at Swansons at our doughnut stop and got the full scoop. What luck! It was nice to get confirmation that it really was just a hurt leg and this isn’t another “Moe the miniature donkey is spending the winter in Hawaii” thing that we didn’t buy for a minute two years ago. The whole tree experience is pretty cool at Swansons. The kids ran through aisles of trees hanging from the ceiling and soon found “Fluffy,” the perfect tree. 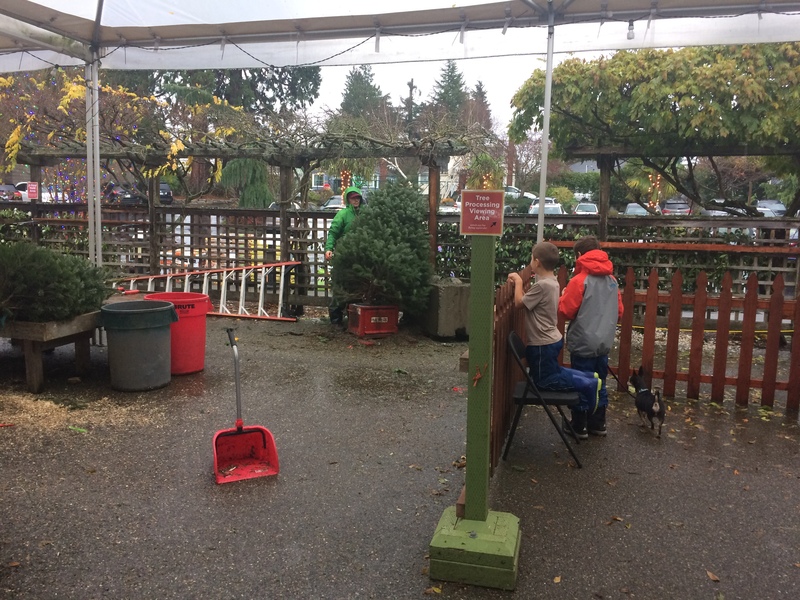 Everyone was extremely helpful and very complimentary about the kids’ tree choice. I left the kids watching the tree shaker (to remove loose pine needles?) while I paid and unlocked the bikes. 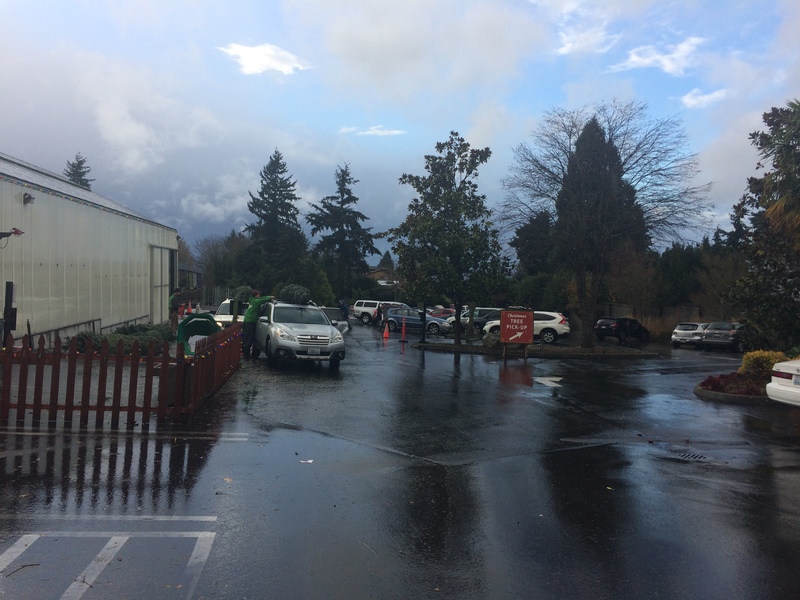 Biking through the drive-through tree pickup area was way fun. They were pretty excited about the bikes and did all the loading. 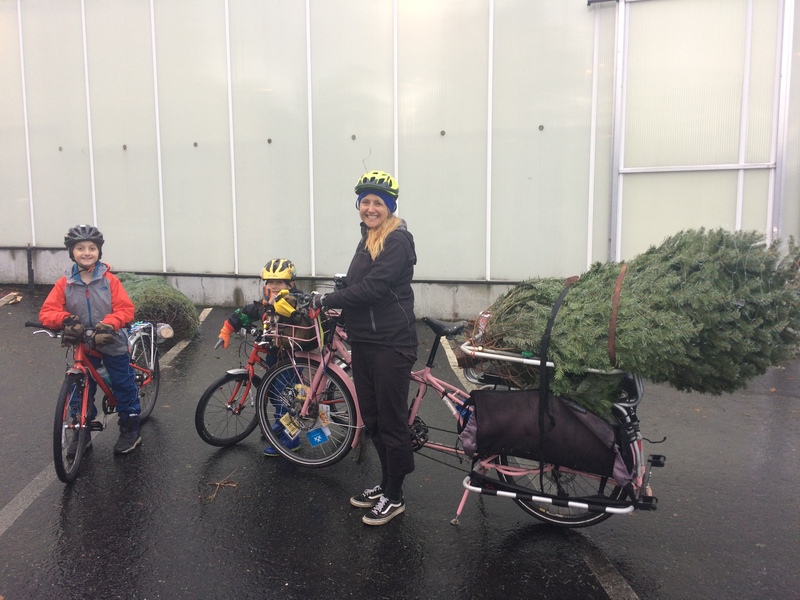 My Big Dummy wore its Xtracycle WideLoader so I could load it on the side (pro tip: load your tree on the left side so people passing in cars can see it and be impressed), but Fluffy was bigger than last year’s tree so we put it on top of the deck. 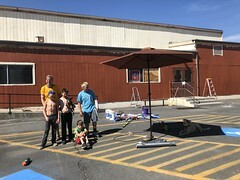 I secured it with my favorite long lashing things: a Yuba Cargo Strap and Xtracycle Utility Belt and the Swansons guys tied Fluffy’s trunk to my Hooptie very securely. To break up the ride home we stopped to get pizza to go. 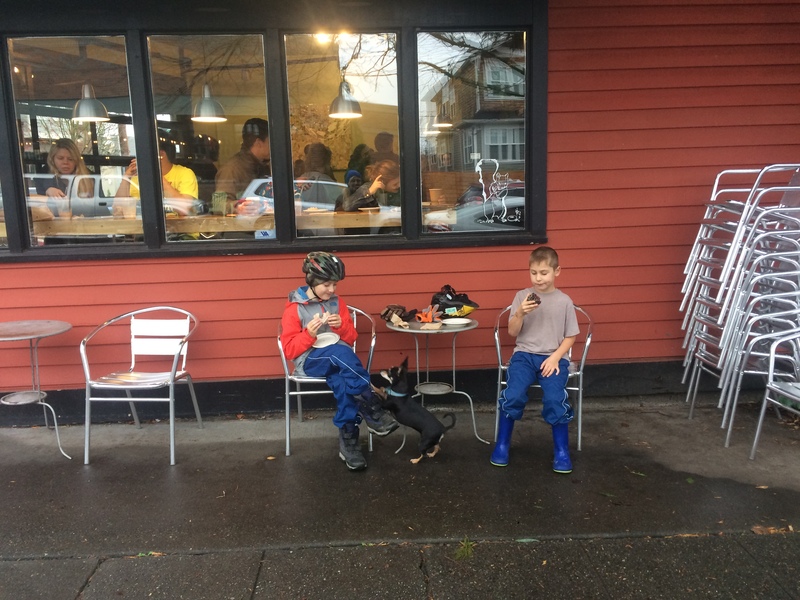 Again, the kids didn’t want to wait inside warm and dry without me and Pixie, but we were between rainy spells and they hopped around enough and crashed their bikes into one another over and over to stay warm. The bummer about having the tree up on the deck was that I didn’t have a nice spot to put the pizza. My other usual spot is in the front basket, but that’s Pixie’s domain now. So I wrapped it in my rain skirt to keep it from the drizzle and bungeed it atop the tree, hoping it wouldn’t leave a square wilty spot on Fluffy during the final two miles.